CONCERNED ABOUT LOSING YOUR BALANCE AND GETTING HURT FROM A FALL? 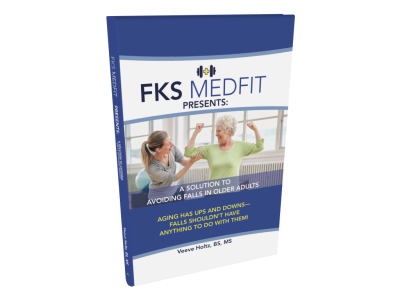 FKS MEDFIT specializes in geriatric fall prevention with services offered online, to help adults 60+ prevent falls! Our geriatric fall prevention expert and CEO, Veeve Holtz, is passionate about teaching mature adults and their families practical techniques to avoid succumbing to the habits that often result in a fall. "We are on a mission to helping the aging population live their best years happily, safely, and confidently on their feet!" Live Your Best Years Worry Free! Through our online geriatric fall prevention services, we provide fun and interactive e-coaching fall prevention interventions to inspire older adults (over 60) through Faith, Knowledge, and Strength (FKS). We are answering the call to help the entire person function better and increase their phyisical mobility, and the bonus...its done in the comfort of your own home. That means no hassle leaving home, or driving to an appointment, just power on your computer and meet us online! FKS MedFit aim to enhance faith, renew hope, minimize muscle deterioration, and reduce the risk for cognitive and physical declines (and falls!). CHECK OUT OUR BOOK AND ORDER YOU COPY!